Which are the highest paying jobs and career options? Working professionals and students across the world are interested in knowing the answer to this question. A Highest Paying Job means a lot of money. You can fulfill all your desires. It also offers a sense of financial security. You can have a good lifestyle and social status. 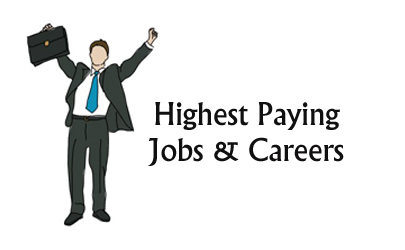 If you are looking for a career change, here is a list of Top 10 Highest Paying Jobs and Career Options. Before going ahead with the list, let me share few significant points. All the jobs which are mentioned in this post are paying high salary and highly rewarding. But Salary amount may vary with time, economic condition and sector performance. Each job mentioned in the list is unique which will require the necessary skills and domain knowledge. You may need to undergo training or a specific course. Now, let’s look at High paying jobs and career options. Medical Profession is one of the highest paying jobs all over the world. A medical professional could be doctors, dentist, physiotherapist, gynecologist or even a pathologist. Out of these doctors with MBBS and specialization degree earns the most. Medical professional like a doctor can work in government as well as private hospital or they can even start own clinic. Earning of doctors is highly dependent on the skills. Apart from good earning this profession also gives a sense of satisfaction about serving people and making them healthy or disease-free. If you really want to serve the nation you can opt for civil service examination. The government offers highest paying jobs to civil service people such as IAS, IPS, IRS, IFS etc. These jobs are nation building jobs. A selection process of civil service is very tough. Apart from that, you can also plan to apply at PSU such as ONGC, BHEL, SAIL, BPCL, GAIL, HPCL. These companies offer high paying jobs along with salary you will also get benefits like perks, low-interest loan, medical benefits, LTC etc. Commercial Pilot is among highest paying jobs. If you want to earn good money especially at a lower age you should think of becoming a commercial pilot. The starting salary of a commercial pilot is in between Rs.1.5 Lakh to 2 Lakh per month. It requires immense training and specialized coursework. There are many government organization which offers commercial aviation course. The career of a commercial pilot is challenging as they need to travel a lot and most of the time they are in the air. Management professional is another set of career option which offers high paying jobs to individuals. Management professional role is required in most of the business areas like marketing, finance, human resource, logistic etc. To become management professional, you need to complete the MBA or PGDBA course. There are many business schools available in India, make sure to select the best business school which offers job via campus recruitment. If you are unable to join direct MBA course, you can opt for BBA course. After completion of BBA, you can go for MBA. Chartered Accountant is the most promising and one of the highest paying jobs. A task of a chartered accountant is to keep track of financial affairs of businesses. CA’s (Chartered Accountant) are required for auditing and account related work. Chartered Accountant is for commerce graduate. You need to do a lot of hard work to complete CA coursework. As a CA you can opt for a job or start your own practice. A good CA gets monthly salary package of 1 Lakh to 2 Lakh. An architect is an evergreen career option. Creative and skill architects are always in demand. The main task of the architect is planning and designing home and other structure of the clients. An income of good architect is in the range of 1 Lakh to 1.5 Lakh per month. There are many architects who work as an independent interior designer. A combination of creativity and technical skill makes a good architect. To become an architect, you should be good at drawing. A scientist is another evergreen career option where you can get high paying jobs. There are very few qualified scientists in our country. The government is giving special attention to R&D and ready to employ good scientist. Some good areas where scientists are required are defense, agriculture, fisheries, biotechnology, food processing etc. Advocate or lawyer is a profession which always remains in demand, irrespective of economy or business condition. Advocates are required in different fields such as criminal, litigation, taxation, corporate etc. A corporate lawyer and criminal lawyer are a highest paying job option. A corporate lawyer earns approximately 8 Lakh to 10 Lakh per year. Investment bankers act as an intermediary between the capital market and investor. They provide asset management services to investors and institutions. It is considered one of the premium fields in the finance industry. To make a career in investment banking you should have a bachelor’s degree which belongs to finance/commerce background. There are very few organizations which provide investment banker course. It is one of the very good career options. You will need good analytical and communication skills to become an investment banker. Merchant Navy is a team of people who manage commercial shipping operation. This business is very challenging as most of the time you will remain in a ship sailing at sea. There are few courses available at college to become a navy officer. These courses are offered after 12th standard. The salary of a navy officer is in the range of Rs.50000 to 1.5 Lakh per month. Apart from salary, you will also get handsome perks and free food while on the ship. So, those were the top 10 Highest paying jobs and career options that managed to get into my list. I know that there are many other career options which can earn you better money. But, I have shortlisted options where proper training or coursework is available. A working professional or student looking for high paying job should analyze pro and cons and take appropriate decision. If you feel that any other career options or jobs are missing in above list which could be highly rewarding, please add it into the comment section given below.